On Monday, November 10th; our school celebrated Remembrance Day with our annual ceremony in the morning. A big thank you to the veterans, the community members, parents and friends who attended to celebrate with us. Mr. Len Boudreau was our guest speaker and we would like to thank him for joining us this year. 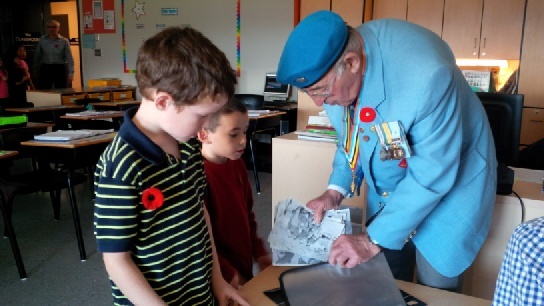 Following the ceremony our friend Mr Terry Flynn spent the morning with our elementary students explaining his experience with war and showing them pictures and medals from his time in the service. Thank you Mr Flynn for speaking with us and sharing your story. Posted on November 12, 2014, in Notices. Bookmark the permalink. Leave a comment.